It has different perceptions for everyone and is influenced by changing horizons relative to both viewpoints and circumstance. 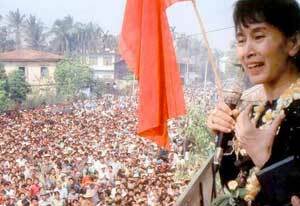 On the recent weekend 3 unrelated events occurred: Aung San Suu Kyi was freed after 7 years of house rest - though she has spent most of the last 20 years under house arrest. She has won freedom -again - on her terms. Somali Pirates freed the Chandlers - a couple kidnapped 388 days ago, after a ransom was paid. They have won freedom on their terms. My grandson, perhaps stimulated by his 1st birthday, found freedom in walking. He has found freedom on his terms. Learning to walk by falling over and hurting ourselves is a first determined step to explore the boundaries of freedom. Too often, however, we allow self-imagined hurts and boundaries to diminish our natural pioneering spirit to pursue the freedom we truly seek. The key is to accept that the price for freedom is like success. It has to be paid in full and in advance - whatever that price is that you have decided beforehand you are willing to pay: Be it in time, money, energy, frustration, and failure. Show me an overnight success and there will be many years of determined commitment already paid in full. Whatever is the price required for living the way you want has first to be deemed worth it - that is what having the courage of your convictions is really about: they are terms you have set for yourself. When things get tough, really rough, and you give up, as the majority do, you lose the right to have the freedom you want. So the answer is simple but hard: Whatever is important to you, do not give up - stretch your own boundaries, because you have the potential to be as free as you allow yourself to be.